Welcome to My Five Favorites today! I'm so excited to share my favorite hair and beauty products with you this month. 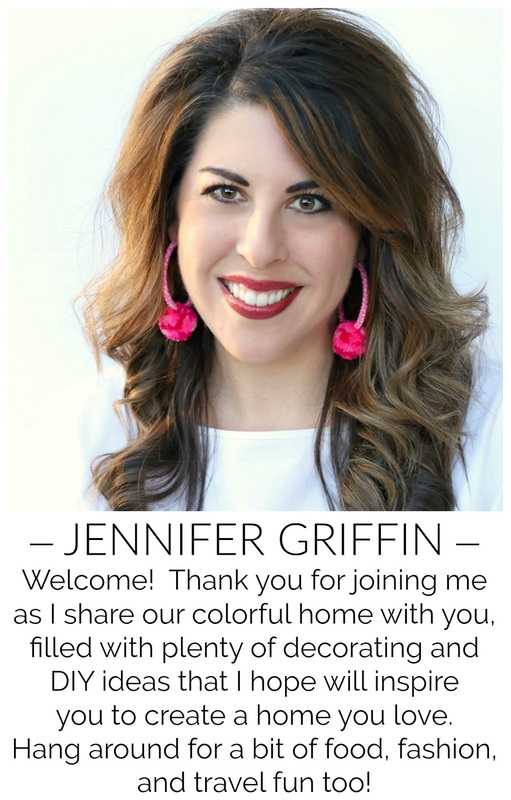 Pam from Simple Details, Lisa from Shine Your Light, and Kris from Driven by Decor are joining me sharing their picks for beauty and fashion too. 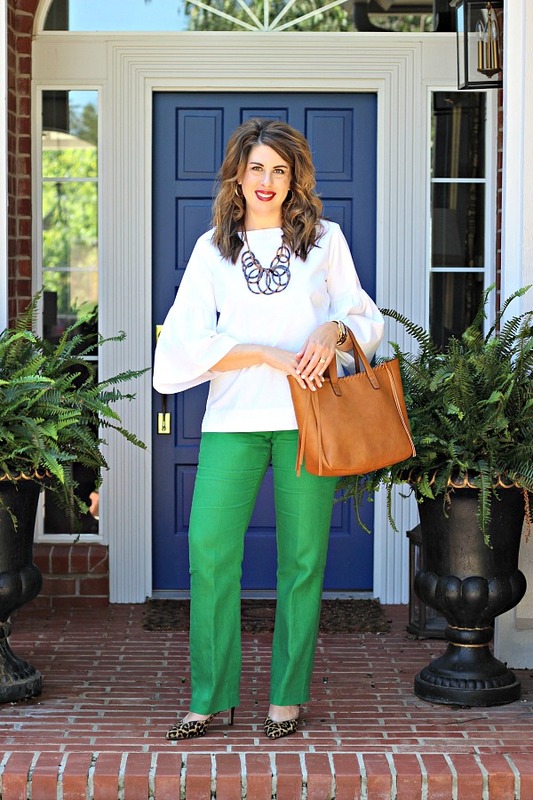 We're delighted to have Cindy from Rough Luxe Lifestyle as our guest host today. Cindy has an elegant, sophisticated yet relaxed style both in her home and beauty and fashion choices. Wouldn't you have loved to be her guest at this casual dinner with friends she recently hosted? Be sure to stop by Cindy's blog and say hi! I'm looking forward to sharing my picks with you today, I've wanted to tell you about some of these for quite a while but was waiting until I could group several things together in a post like this. Just so you know, I don't have a fussy hair and beauty routine at all. Most of my products come from the drugstore and I don't like to spend a lot on them. When I find something I like, I generally stick with it for quite a while! I love to have my nails painted, but don't do it as often as I would like. Inevitably, as soon as I paint them I end up doing a project that messes them up! However, I've been making an effort to paint them more often, and a few coats of this topcoat makes a huge difference in the durability of my polish. Without it, my nails are usually chipped after a day. With it, I can usually get a good week with my nails still looking nice, and it would probably last longer if I did a better job of using gloves when I wash dishes. 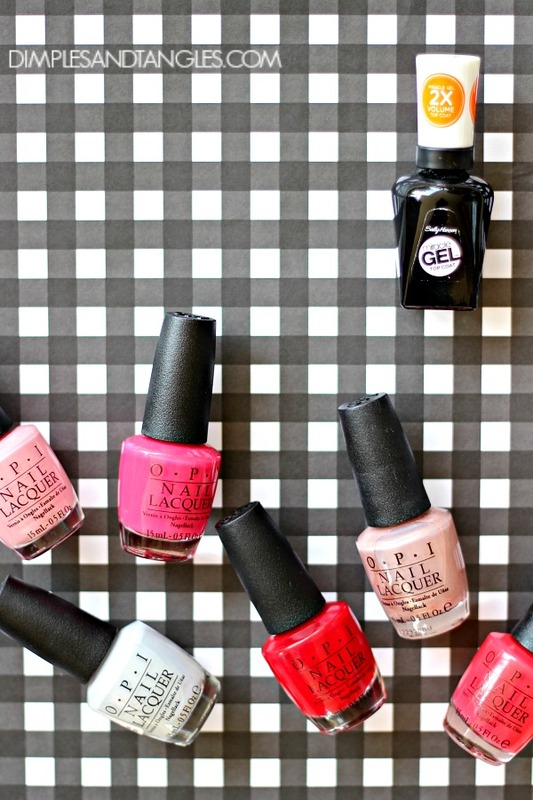 There is also a variety of nail colors in the same miracle gel line, but I use my favorite colors that I already have and it works just fine. I don't use anything fancy on my hair. Right now I'm using Dove shampoo and conditioner, and while my hair is still damp before a blow dry I've been using this sea salt spray. You know how your hair always does better when it's a little bit dirty? This gives clean hair a nice bit of grip and helps lock in my curls. This travel size is great for packing, too! After styling I finish up with a bit of hairspray ($4 Aussie is my favorite- thank you 1990s) and that's it! I've also been using NYM's Clean Freak dry shampoo when I'm trying to go one more day without washing my hair. I've been happy with it and it helps me squeeze in one more good hair day. Almost a year ago the foundation I've used for a long time just wasn't cutting it for me anymore. When I need something new I always talk makeup with my sister because that's her thing, and this was an inexpensive foundation that she mentioned had really good reviews. I tried it and loved it right away! I apply it with a foundation brush and I'm really happy with the covereage. It does a nice job of covering my red areas and after I finish it off with some powder, I can get through the day without major touchups necessary. It also has added SPF so that's always a good thing! I have two different colors, one for the summer when my skin is a little darker and one for the winter. Even with a good foundation, a great concealer is crucial! 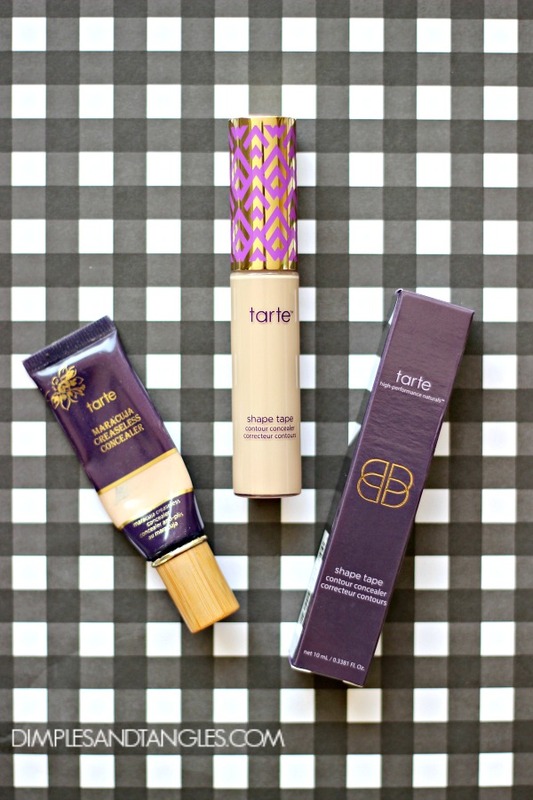 For about the last year I've been using Tarte's Creaseless Concealer. It blends nicely and lasts all day. It's almost gone and I've wanted to try the Shape Tape too, so I picked some if it up and I like it just as much. I don't think it's quite as thick as the tube concealer, but I'm really happy with the coverage of both of them. It costs a bit more but it lasts a long time, and as you can see I obviously don't spend a lot on the majority of my products so I'm ok with a splurge once in a while. Up until a few years ago, I still used a set of hot rollers to curl my hair. When we had a few international trips scheduled and I knew I didn't want to haul that bulky set with me, I asked my hairdresser to teach me how to curl my hair with a flat iron. I've been hooked ever since! 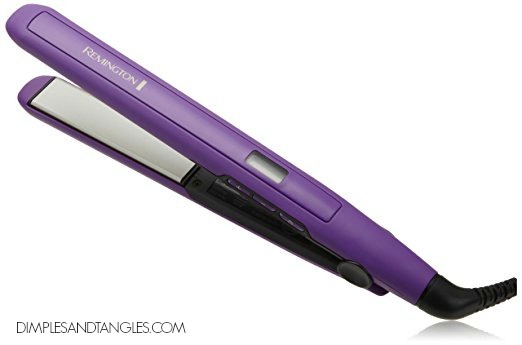 This flat iron is under $20, and mine has been going strong for well over 2 years! I love that it heats up fast and has an adjustable temperature (I turn mine all the way up to 410 degrees) and auto shut off. The curls lasts until the next day usually and I just need to touch up a few spots and it's good to go. I actually have another one that I spent more money on, and I prefer my cheapy! Those are my top 5 picks, but I couldn't help adding two more to my list! They're long time favorites and I didn't include them in my 5 because I've blogged about them before, but in case you missed those two posts, here you go! My favorite lipstick, I posted about it here and shared all of the colors I use. 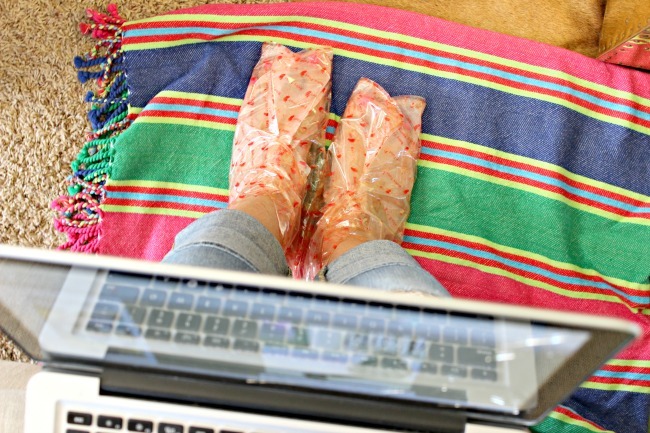 I mentioned this foot treatment in my "Day in the Life" post last week, and gave some tips for using it here. 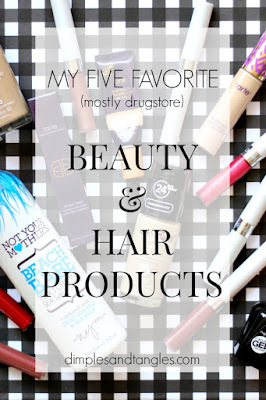 What are your favorite hair and beauty products? I'm dying to know! Be sure to head over and see what these ladies are sharing today, also. I love finding new products to try! Be sure to pin this graphic to your favorite board to easily refer to this post in the future! Yes, please do a hair curling tutorial! I love that idea! Oh, there's all kinds of things for me to try! 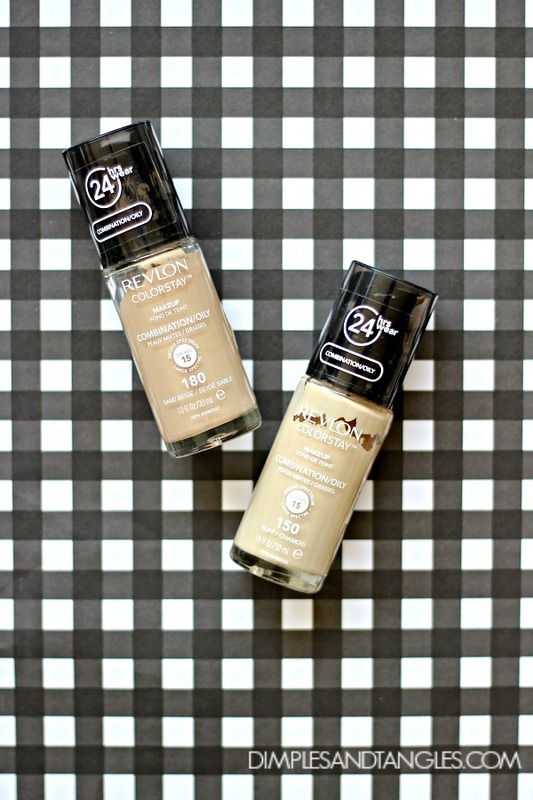 You have me curious about the concealers, and also wondering the difference between our foundations, I posted Revlon too. Definitely need to check those out! 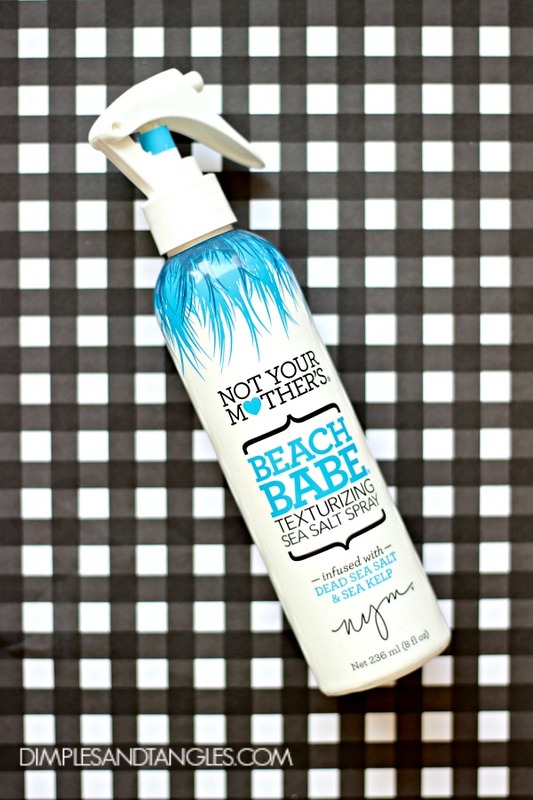 I've used Not Your Mother's Dry Shampoo and it's good too! Sign me up for the hair curling tutorial too - I never knew you could do that with a flat iron! 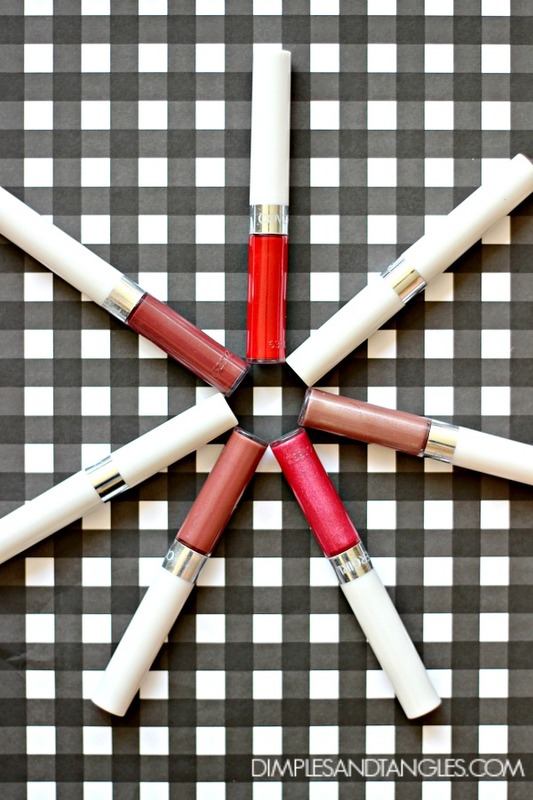 Love your product recs and I'm going back to check out your lipstick colors too - I need some good new ones! Hi Jennifer I commented yesterday on my cell and it looks like it didn't post! I am with Kris. Your hair is gorgeous. I am going to forward this to my daughter (who is probably about your age!) She needs one of those flat irons! I used that Revlon Colorstay for years until (ahem) i needed more coverage for the wrinkles. It is a great product. Thank you so much for allowing me to be a part of the fab four. You ladies are the best!! 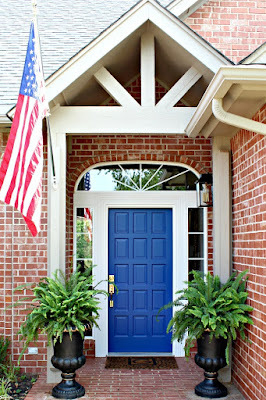 I came from CINDY's BLOG and just wanted to POP in and see what you LADIES were chatting up about! 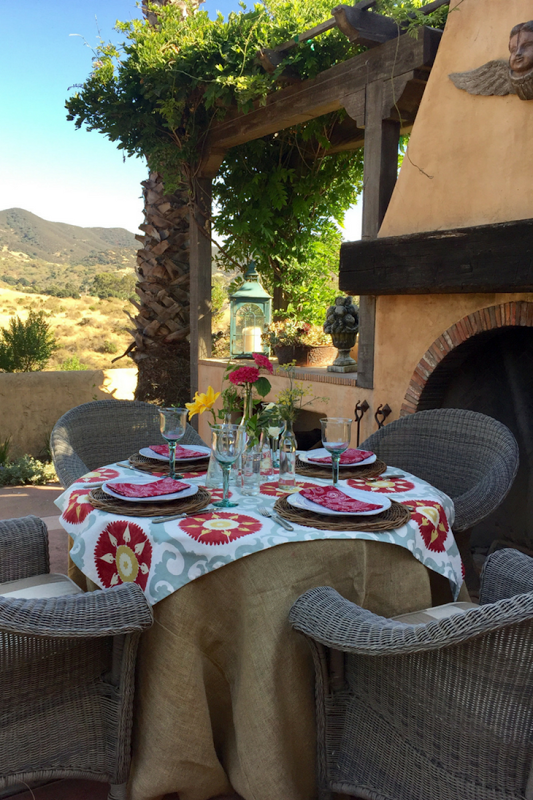 (I have had the opportunity to dine at CINDY's CASA! )It is an OASISI!! !Looks like between all of YOU you have the make up COVERED! Ooooh! Must try no.2 for sure! Thanks for sharing! You look cute on your outfit!